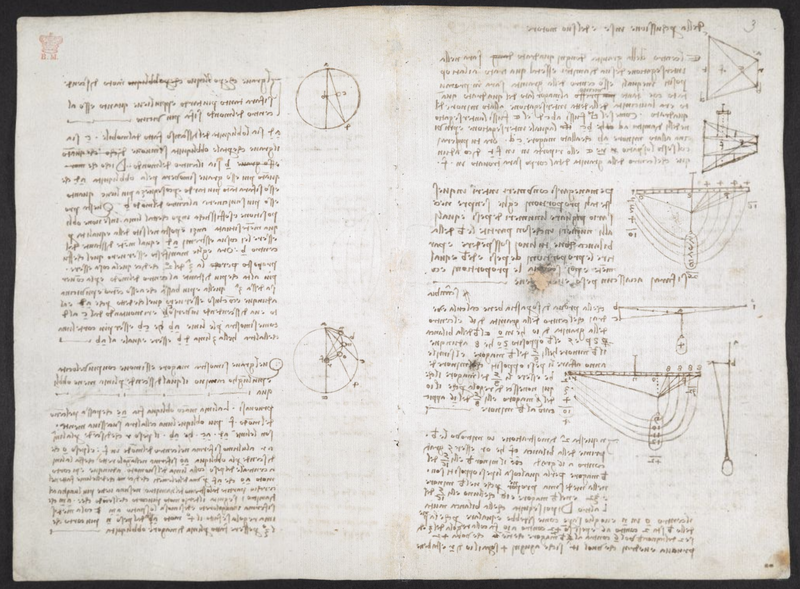 The British Library has digitized 570 loose pages of notes written and drawn by Leonard da Vinci to compile a notebook which is called, The Codex Arundel. The digitised British Library manuscript is a fascinating artefact in itself, just to browse. You don't need a translation to appreciate the beauty and wonder of Leonardo's mind. This is a great work of art, in a precociously conceptual genre that has been emulated by modern artists such as Joseph Beuys and Cy Twombly. Leonardo repudiated perpetual motion, understood the principle of relative motion, and foreshadowed Newton's Third Law by two centuries: "For every action there is an opposite and equal reaction." He rejected the notion that the Biblical flood was responsible for depositing fossils many miles from their origin and deduced the existence of very long spans of geological time. By dissecting humans and animals, Leonardo made many anatomical and some physiological discoveries. He investigated optics and perception with subtle experiments, explaining why the sky is blue, arguing that light has a finite velocity and travels in straight lines, and deducing the existence of a surface within the eye that receives light from a wide field of view. Leonardo formulated the law of the flow of currents: "All motion of water of uniform breadth and surface is stronger at one place than at another according as the water is shallower there than at the other."